Let us rewind it for you. 1st May,2009, two young, enthusiastic, hard working fellows thought of kick-starting a venture that would make the web a better place. As the norm goes by, starting one’s own business is no easy-peasy task. People have to go through a lot to realize their dreams and we literally mean a LOT. But, Tough Times don’t last but Tough People do. Anil and Aslam started Multidots with the vision to deliver quality web design & development services to everyone who wanted an online presence but couldn’t afford big bucks. It all started with a $300 project in 2009 and we think the rest is already in front of you. 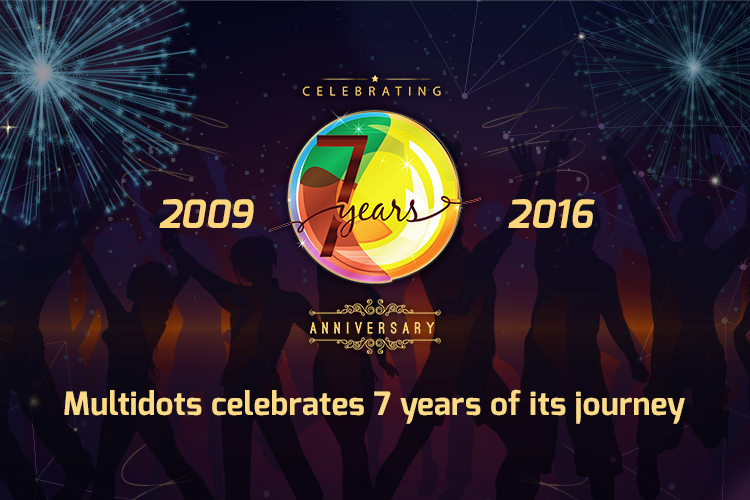 Multidots, as you know it today has evolved over these 7 years and continues to make a lasting difference in the lives of not only its employees but also its clients and stakeholders. Very few companies belong to this cadre. Go steadily, slowly, and build a strong, lasting foundation. As Multidots marks its 7th anniversary, we take this opportunity to thank every person including family and friends who have stood by us through thick and thin. It would not have been possible without these people. It is the employees and the support staff that have made Multidots what it is today. And, you guys continue to take Multidots to higher levels of success. Let us get you a sneak peek into the 7th Anniversary Celebrations. We started with an official tour of our new office to give our guests a feel about the office culture and overall atmosphere. Followed by our founders’ vision and goals for the coming years and making Multidots a global brand. Getting a word of advice & feedback from parents & elders is simply unmatched even today. May we continue to scale higher and newer peaks with your support and love! God bless you all. Congratulations Team Multidots, Looks awesome – Best Wishes!